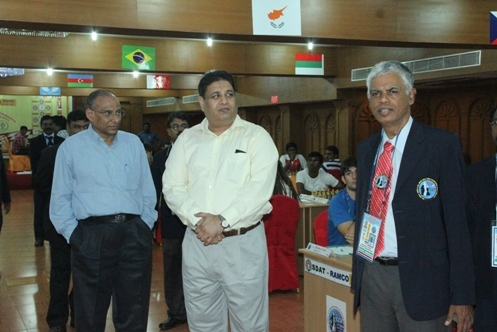 Chennai lad V A V Rajesh, a student of Loyola College, Chennai stole the limelight holding top seed Russian Grandmaster Maxim Matlakov to a draw, in the first round of the SDAT- RAMCO 50th World Junior & 29th Junior Girls Chess Championships 2011 at Hotel Vijay Park, Chennai here today. The lesser seeded players stole the show, holding their higher rated opponents in an interesting opening day. Also snatching half a point from Grandmasters were R Ashwath, Sayantan Das, R A Pradeep Kumar and S L Narayanan. These young Indians drew with GMs Robert Hovhannisyan (Armenia), Swiercz Dariusz (Poland), Adhiban Baskaran and S P Sethuraman (both India). For the Chennai based GM’s Adhiban and Sethuraman, the draw in the opener comes as a mild shock to spur them into greater action in the next round onwards. The girls section saw higher rated Indian star Bhakti Kulkarni being held to a draw against Woman International Master Guo Emma of Australia. Fifth seed and medal favorite Padmini Rout nursed an extra pawn, defeating Brunello Roberta of Italy. 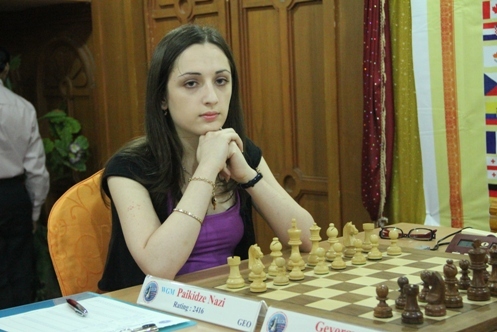 Top seed Woman Grandmaster Paikidze Nazi of Georgia scored over Armenian Gevorgyan Maria. Take a look at the large photo gallery, courtesy of Peter Long. Earlier today World Chess Champion Viswanathan Anand inaugurated the Championships together with the Tamil Nadu officials. This 13-round mega event concludes on 15th August, 2011. V A V Rajesh (India) 0.5 drew with Maxim Matlakov (Russia) 0.5, Sjugirov Sanan (Russia) 1 beat Rojas Alarcon Julian Antonio (Mexico) 0, Aaron Deepak (USA) 0 lost to Salgado Lopez Ivan (Spain) 1, Shimanov Aleksandr (Russia) 1 beat Tomazini Zan (Slovenia), Kozganbayev Erken (Kazakhastan) 0 lost to Tamir Nabaty (Israel) 1, Ter-Sahakyan Samvel (Armenia) 1 beat Botta Gabriele (Armenia) 0, R Ashwath 0.5 drew with Hovhannisyan Robert (Armenia) 0.5, Ray Robson (USA) 1 beat Hemant Sharma 0, Das Sayantan 0.5 drew with Swiercz Dariusz (Poland) 0.5, Baskaran Adhiban 0.5 drew with R A Pradeep Kumar 0.5, S P Sethuraman 0.5 drew with S L Narayanan 0.5. 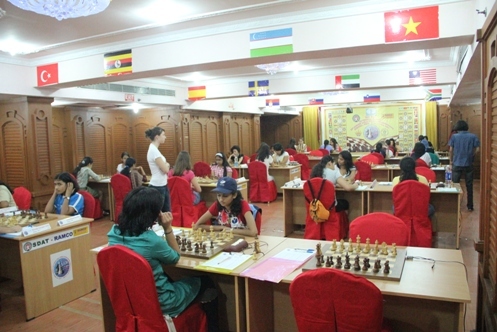 Paikidze Nazi (Georgia) 1 beat Gevorgyan Maria (Armenia) 0, Edes Zsofia (Slovakia) 0 lost to Savina Anastasia (Russia) 1, Cori T Deysi (Peru) 1 beat Pratyusha Bodda 0, Michelle Catherina P 0 lost to Girya Olga (Russia) 1, Padmini Rout 1 beat Brunello Roberta (Italy) 0, Guo Emma (Australia) 0.5 drew with Kulkarni Bhakti 0.5, Mammadova Gulnar Marfat Qizi (Azerbaijan) 0.5 drew with Ivana Maria Furtado 0.5, Martinez Ayelen (Argentina) 0 lost to Bulmaga Irina (Romania) 1, Kazimova Narmin Niazami Qizi (Azerbaijan) 1 beat C H Savetha 0, A Akshaya 0 lost to Eric Jovana (Serbia).